Today, Maxine is going to take you step by step to create a gorgeous craft and to give you the tips and tricks you need to craft two more wonderful makes. 1.Cut a 12.5cm x 17.5cm piece from your First Edition Pretty Posy 8x8 paper pad. Cut a 12cm x 17.5cm piece of coordinating Pretty Posy paper and layer on to the first sheet with Dovecraft Perma Fix tape. 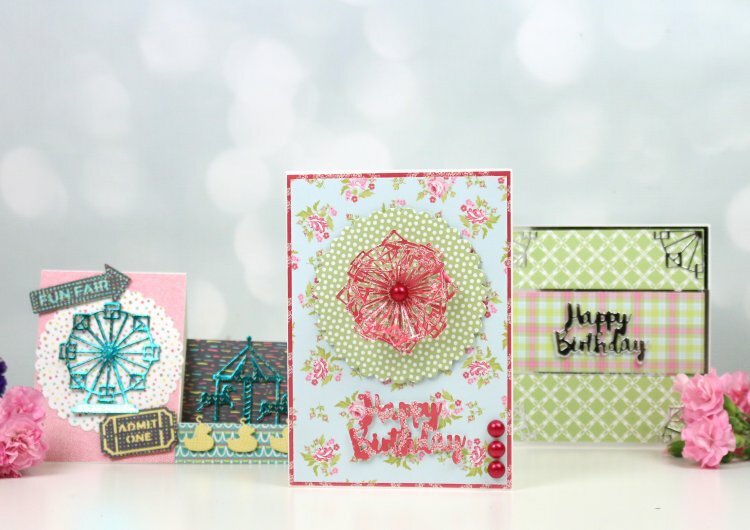 Add your layered pieces to the centre of your Dovecraft 5x7 card blank. 2.Die cut the Ferris wheel within your First Edition Fun Fair die set, three times onto the same patterned sheet from your First Edition Pretty Posy paper pad. Ensure to cut off the bottom section of each die cut. 3.Layer your Ferris wheel die cuts together with Dovecraft Perma Fix tape, ensuring to scrunch the top two die cuts to add dimension. TIP: When you layer your diecuts, place each one at a different angle to add interest. 4.Die cut the second largest die from the First Edition Scalloped Circle die set onto a matching sheet of Pretty Posy paper. Adhere with 3D foam pads 8cm down from the top of your card. With Dovecraft Perma Fix tape, add your Ferris wheel flower topper to the centre of your scalloped circle die. 5.Add a Simply Creative Pearl to the centre of your topper and three in a vertical line to the bottom right hand corner of your card. 6.Die cut the Dovecraft Happy Birthday die onto the same Pretty Posy paper as your Ferris wheel flower topper. Adhere this toward the bottom of your card with 3D foam pads to finish. The Ferris wheel die makes a lovely flower topper on this project. You could experiment with this technique on different paper designs depending what occasion you’re crafting for. Maxine has used a lighter toned paper for another topper which creates a gorgeous, delicate look on her gift box! You could also cut the Ferris wheel die into four and use each piece as a classy corner for your craft. It’s great way of adding detail to your card making projects! Alternatively, you could using the First Edition Fun Fair die set to build a scene filled with excitement! The colourful First Edition Pick n’ Mix papers work perfectly alongside this design! Upload your crafty creations to the project gallery to show us how you’ve been inspired to use your First Edition die sets in new ways! Always remember to help us have a peek at your crafts by uploading your makes to the project gallery and #Trimcraft on social media!